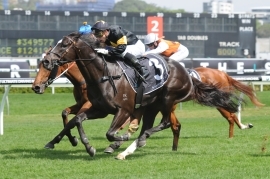 Better Than Ready ($140,000 2011 Easter, 3c More Than Ready-Sally’s World) sat off a hot speed in the black type event before mowing down his rivals close to the post. The colt held a long neck margin on Group 2 winner Jolie Bay at the finish, with Brave Soul a further length away in third. “It [Stradbroke] is a race that has a good record for three-year-olds and it's a race I've always thought would suit him.